Celebrating the 25th birthday of its iconic two-seat sports car this year, Mazda launched MX-5 Roadster Coupe 2.0-litre 25th Anniversary Limited Edition. First revealed to the public on 9th February at the 1989 Chicago Auto Show, the Mazda MX-5 caused a sensation. Reintroducing a category of vehicle that had become all but extinct by the early 70s, it was an instant hit on a global scale, far outstripping the company’s own sales predictions. When global production reached 531,890 units in May 2000, the little Mazda was certified by Guinness World Records as the world’s best-selling two- seater sports car in history. Total global production passed the 900,000 mark in February 2011, and the Mazda MX-5’s Guinness certification was updated. Just 1,000 individually numbered examples of the Mazda MX-5 Roadster Coupe 2.0-litre 25th Anniversary Limited Edition will be built, and the rain held off just long enough for James Lambert and Richard Clapshoe to complete the handover of the first to be sold at Invicta Motors Tunbridge Wells. 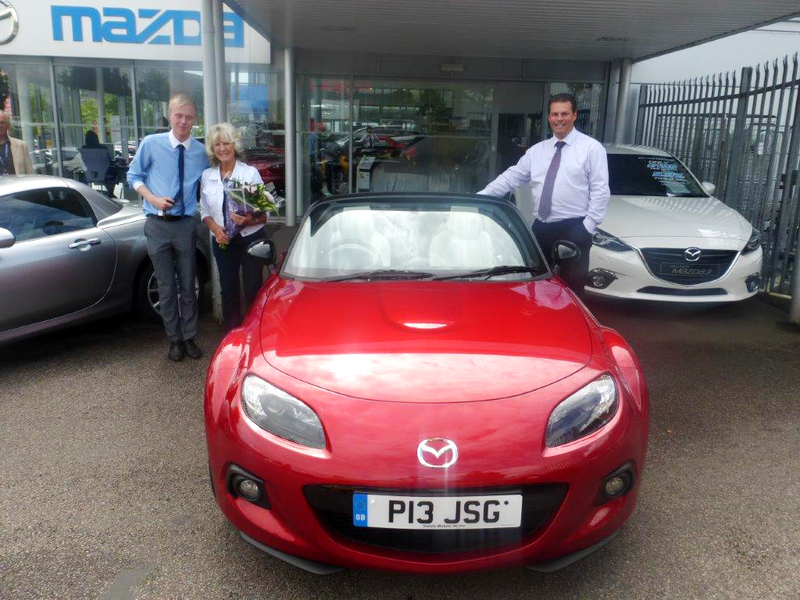 We wish Mrs Gould many years of Happy Motoring!